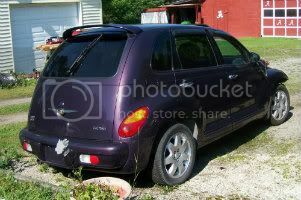 Hi all I'm new to pt cruisers and also this forum. Ok so anyway I am a dad and drove a van for a while (I hated it) bc I love style and performance and the new van I had lacked both. 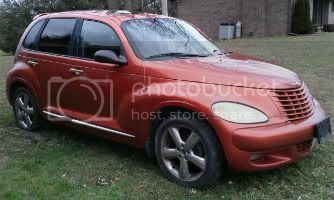 Now I never thought of a pt cruiser before but I was looking at cars to buy and seen one and I instantly fell in love with it. It's electric blue 05 gt 2.4l ho turbo convertable. It had been lightly hit in the front and only has 50k miles. Basically a brand new car. Anyhow I bought the car and it was so clean and had no problems at all. 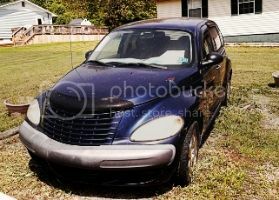 I also bought a parts pt cruiser for the front end bc I wanted to put the oem body panels back on it. Anyway I got both of them home yesterday and have since stripped the front end off the blue pt cruiser and inspected motor and so far only prob I've seen is broke starter and power steering fluid box. Anyway I'm getting it fixed but I would like a lil more power nothing crazy where it would risk messing up the transaxle or anything else. But I'd like a lil more punch in other words not an everyday average pt cruiser. It's a bone stock 2.4l turbo with 50k on it. Any suggestions would be greatly appreciated thanks. You're asking for a book's worth of information in one post. Search the forum and you'll find everything you need to know The best way is to search on google, then refine the results to ptcruiserlinks. ---cheap mod you say? You've come to the right place! Ok lol maybe I need to define cheap I have a budget at the moment for aftermarket performance upgrades for motor or suspension for 5000 I would like to stay under my 5k budget. It'll be a daily driver. I mean first thought for me is borla exhaust, k and n intake, and a chip. Any other ideas out there. one thing i can suggest is do a search on turbo models or take your time and look through all of the turbo performance threads. forget about chips, it's a bunch of snake oil. i'm gonna get rid of my k&n drop in filter soon, if you want i can sell it to you. the drop in is still oiled. as for the exhaust, make sure you get a free flow system and a downpipe. For that kind of budget you can get some serious mods. Talk to NitroPT. He and thumper performance can guide you to what you are looking for. From custom head and cams to pcm upgrades and tune. You may only need to spend a few hundred on pcm and tuning equipment to get what you are needing. So give him a shout PM and give him your number and talk it out with him, Save yourself a ton on not buying parts that really don't do much. Join PTCrew.com and look up "the Mod Bible". Let other's experiences guide you..
Word of caution on the mod bible. It is a closed thread and there has been many innovations and some myths dispelled sense, that at the time was considered cutting edge. So not all in there is fact. Though believed to be at at the time to be. So just research newer information to verify any thing you read to see if it's has had an updated improvement to get the best and current info for your buck. Things always change so research. How mechanically inclined are you and/or do you have a trustworthy, capable shop in mind to do your work?